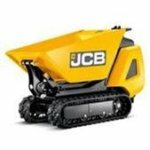 We stock the JCB TD Tracked Micro Dumpers that are 720mm wide and can carry half a ton. They can turn on the spot and can get to most places that a Micro Digger can. 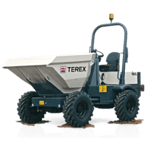 They easily lift into a skip and are one of the most reliable Tracked Micro Dumpers on the market. They are an ideal partner to Micro Diggers when a lot of spoil needs to be removed. Hi-lift dumpers are a perfect partner to Mini Diggers and are easy enough to drive due to the fully automatic hydraulic drive that powers all four wheels. The High Lift ability of these dumpers allow easy disposal of spoil and waste into skips. 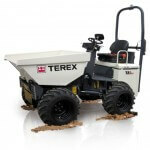 We stock Terex TA1EH and JCB 1THT dumpers which are class leading machines. With a width of 114cm and a fold down roll over bar they are able to go most places. We stock a selection of 3 Ton dumpers, all of them are EU Compliant, have a ROPS frame and green seat belt beacons. We have straight tip and swivel tip dumpers available and it is one of our main priorities that all dumpers have a seat that is not ripped, thusly ensuring a dry place to sit. 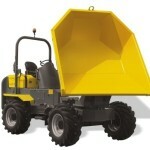 Most of our dumpers are road legal and come with road lights and a number plate. 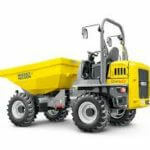 We stock 6 Ton Dumpers from Wacker-Neuson, Terex and JCB. All come complete with a fold down roll bar and green seat belt beacons. We have 6 Ton Dumpers available in either straight tip or swivel tip configurations. Many of our dumpers are road legal, however it is up to the hirer to ensure that machines are insured for road use. We stock 9 Ton straight tip dumpers from Wacker-Neuson, JCB and Mecalec. All come complete with a fold down roll bar and green seat belt beacons.